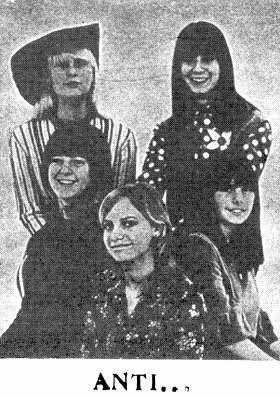 My first “real” band was an all-girl quintet called “The Anti…” We fashioned ourselves after the “Them” with a touch of the “Who” and, of course, the Stones. We did a version of “Gloria” only we sang it as “G_E_O_R_G_E”. 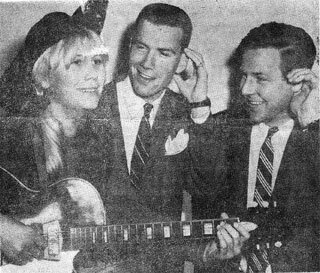 In 1966 H. Liebes, a department store in downtown SF put on a battle of the bands. We made it through the initial auditions. The San Francisco Chronicle called and asked if we’d come by the newspaper for a shoot. This is the photo they chose to plug the “dress rehearsal”at Lincoln High School for the 30 bands selected . Yep, that’s me with the Sears Silvertone hollow body electric — yet another one of those valuable collectibles that I did not hold onto. The H. Liebes “Band- Bash ‘66” happened a week or so later on April 4th and 5th at the Cow Palace. Admission was $1. The Cow Palace (I just had to repeat that name) is a cavernous structure built in 1941 that to this day hosts the national rodeo. Each group that played was hustled on stage, had time to play a very short set and then was hustled off again. Though “The Anti…” didn’t make it to the finals the experience was exhilarating. I was utterly stage frightened but I got the chance to play music for lots of people in a very, very large venue. 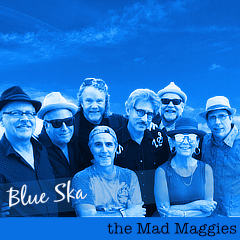 Here’s the band photo from the Band Bash program. Amazing stuff. It was incredible to see the musical beginnings of our beloved maestro. How can the rest of us top that? The stakes are high, lads.